Since we live so close, this is our second time going to Yosemite this year! We love it there! This time around, we decided to camp. For those of you who you know me, you know it wasn’t me who came up with that idea! Right when we got there, it started raining, which made it a pain to get everything set up. I felt like we were running all over the place, trying to get everything in from our car to the tent before it got drenched. After we got all settled in and bundled up, we sat by the fire and had some good camp fire talk. It was so peaceful to actually be able to distance ourselves from the business of everyday life and to focus on and enjoy nature. Life is too busy, and it’s easy to forget to take a minute to enjoy all of the beauty that nature brings to our lives, and this adventure was a little reminder for me to always do that. This time around, it was fun to go down to Yosemite with some of our friends who have had the opportunity of exploring many different parts of the world, and it was inspiring to hear about their adventures to other corners of the world. It was also nice going with them because they really were fun and energetic when it came to exploring trails and hikes. Like I was saying before, I’m not a big fan of camping. Our first night was bitter cold, wet, and our air mattress deflated, so I’d definitely recommend that you bring a foam mattress and a high quality sleeping bag. After our first night, we woke up and made some breakfast quesadillas, packed some lunches, and were on our way. 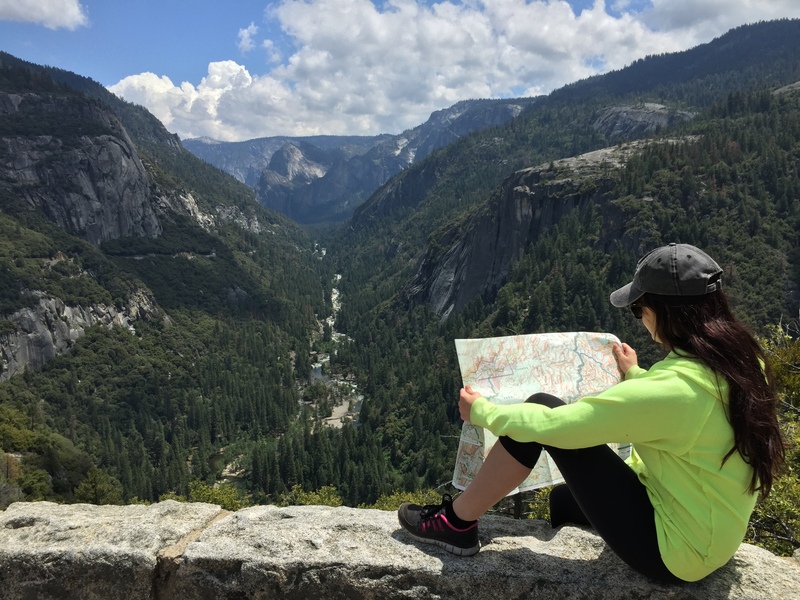 Yosemite is so big that you really can’t see everything in a weekend, but there are definitely some hikes, trails and view points that you don’t want to miss out on. 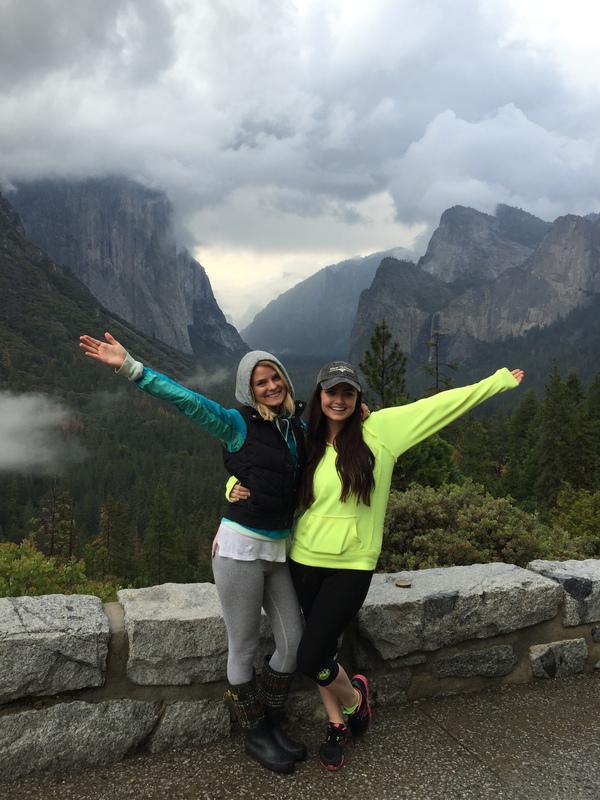 We decided with our friends that we wanted to hike the Yosemite Falls trail, which was a pretty intense hike. Michael and I had previously gone on this hike, but because we got a later start, we weren’t able to make it all the way to the top. Because we got an early start (before noon), and we were better prepared with food and snacks, we were even more determined to make it all the way to the top this time! 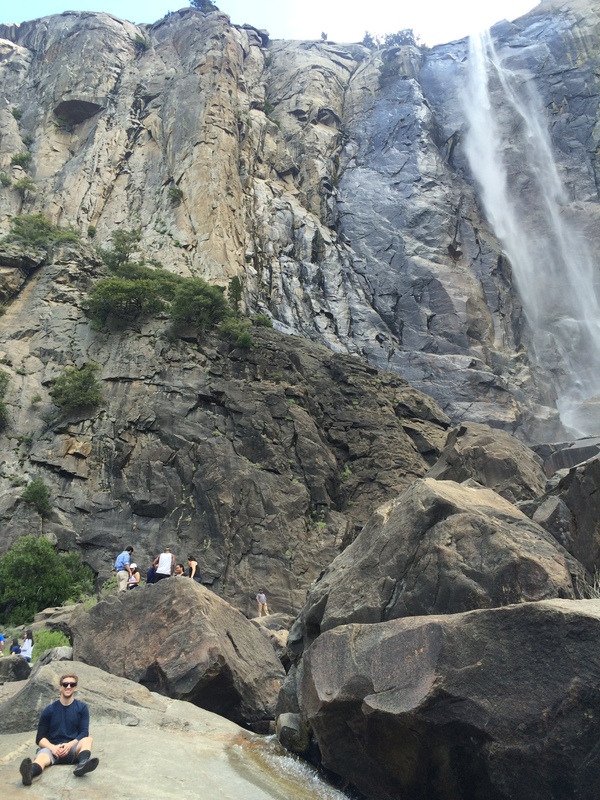 Something that we came to find out on this trip was that Yosemite Falls is the tallest waterfall in North America. It drops 2,425 feet, which makes for a killer hike !! We hiked to a good lookout point along the trail (just off of the main trail as you get about 1/4 the way up), and we all decided to continue on to the top of the Waterfall. It was nice that there were Search and Rescue hikers along our route as well, so it was reassuring to know there would be help for us or any hikers who needed it. When we reached the top, I couldn’t believe how pretty the views were! It honestly doesn’t even look real – it looks more like a painting. Once we made it to the top, we had some snacks and enjoyed the view. I’d also recommend that you go down the the lookout, which is a little scary, but totally worth it! There are railings to help you get there, but even then, it is still scary to see the waterfall rushing out beside you and knowing you’re on the edge of a cliff! Once you get to the lookout, the railings are the only thing between you and 2,000+ feet drop-off. So scary, but such an adrenaline rush! Another fun thing that we were able to do was to continue on the trail for another mile or so to another, even higher lookout point that has even more amazing views! I didn’t think it’d get much better than the first lookout beside the waterfall, but this was even better! Overall, it took us about 6 hours to finish the hike and a couple who was hiking up and down at the same time tracked the hike at about 11 miles or so (including the extra mile or two to the second lookout point). It was totally worth it even though we felt sooooo sore the next day! 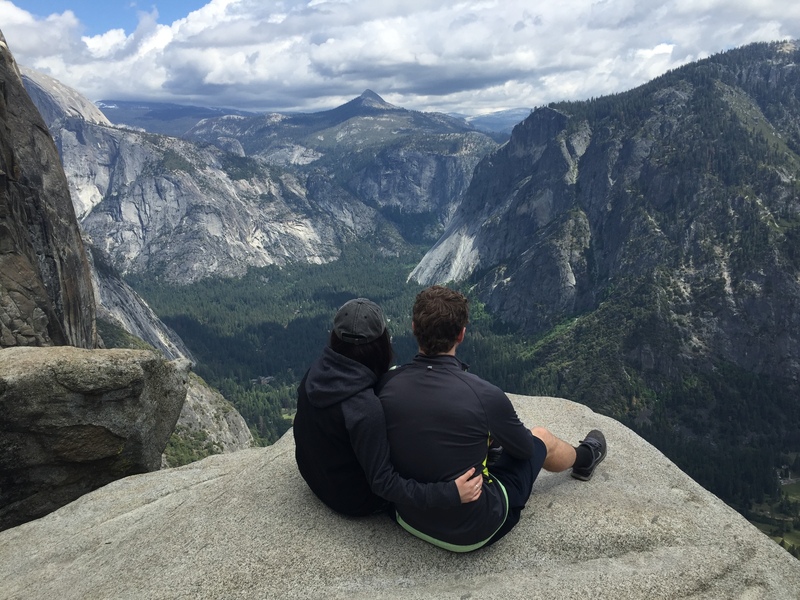 We also met many great, encouraging hikers along the way and we were surprised at all of the different places that people had come from to visit Yosemite. It was also encouraging to have people regularly say “keep going, you’re getting there!” A lot of the people seemed to be from other countries, and it was another simple reminder to not take for granted all of the beauty and amazing nature that we often times have so close to us. Finding a camping grounds apparently can be fairly difficult depending on the time of year, but if you look in the right place, you can most likely find space (we went on Memorial Day weekend and were still able to find space a few weeks in advance). We camped in Crane Flats, which McKelle had found; it was an awesome camping ground, and I was really glad to have had her help in pulling this trip off! Our camp ground was still was about a 20 minute drive to Yosemite Valley (where most of the hikes and sites to see are located), but it was still within the park and a fun little spot to camp. On the day after our Yosemite Falls hike (our last day), we were all really sore, and wanting to do an easy hike. When I say easy I mean REALLY easy…. we’re talking people with strollers and bikes on a paved trail! It can’t get much easier than that! The site was Bridal Veil Falls, and because it’s so easy, you get a lot of people there (which made for a long wait in the parking lot for as we waited for other cars to leave). The trail itself is paved and is about 500 feet until you come to some big rocks that you can climb over to get to the base of the waterfall. People were climbing the rocks as far as they could to get pictures by the fall, and it can be a little slippery, but it’s an easy little walk to see a really pretty waterfall. 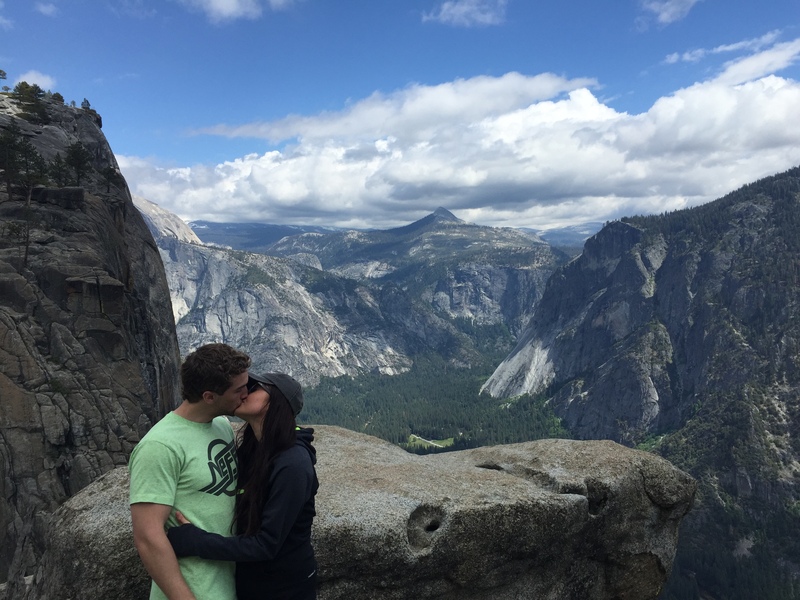 My favorite stop on this trip was at Glacier Point (rated #1 best view in Yosemite on Trip Advisor). 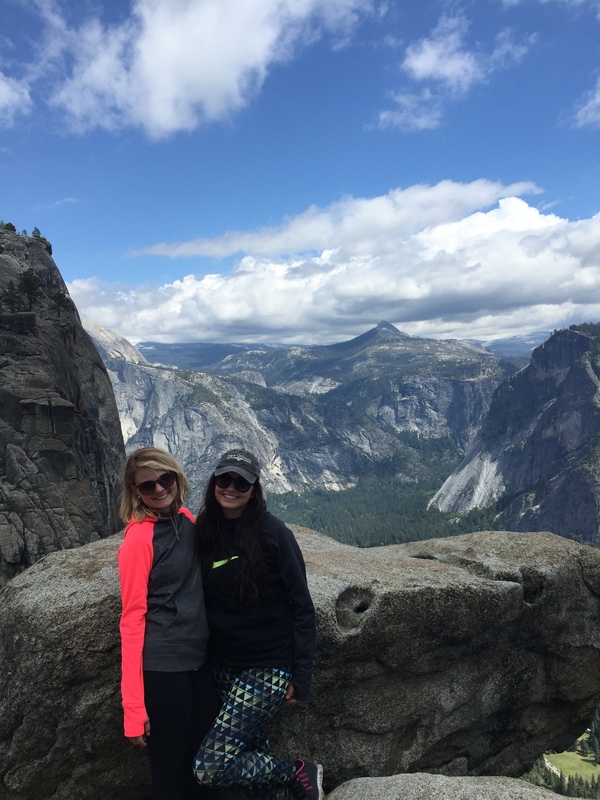 The last time that we came, we went to the top of Sentinel Dome (which is on the way to the Glacier Point lookout), and the view there was amazing (it was an easy 1-2 mile walk/hike), but Glacier Point was even better! 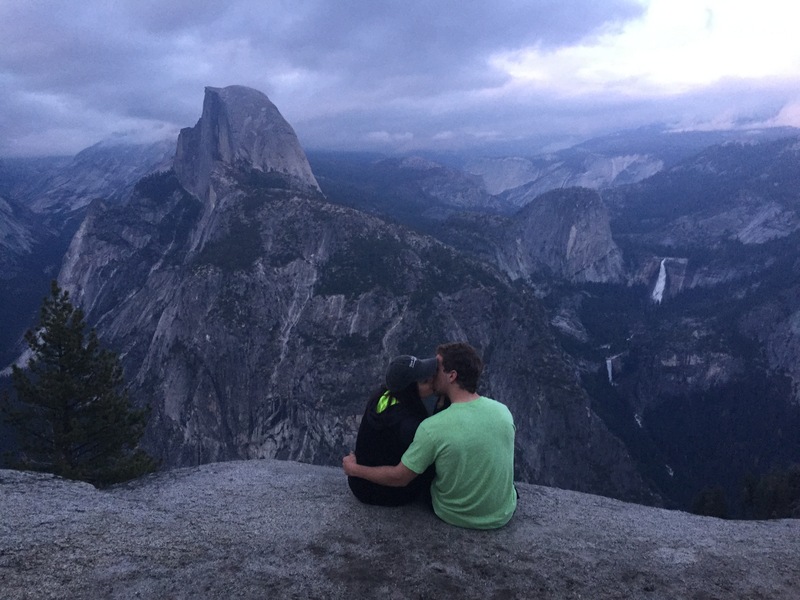 We got there right at sunset and it’s here that you can get the best view of Yosemite! If you don’t have a lot of time, or are passing through, GO HERE! This can be a trip that’s great for the whole family, a road trip with friends, or even a solo getaway! There are so many different trails and the levels of difficulty accommodate all age levels. 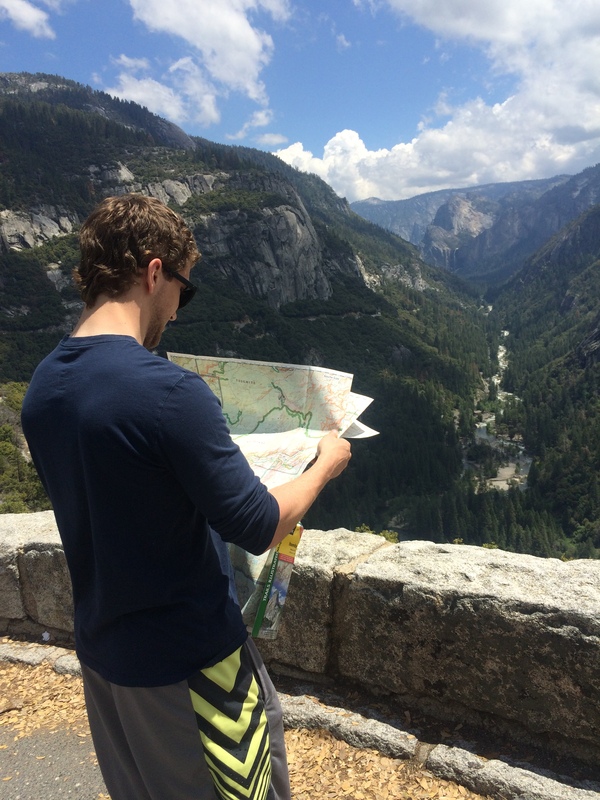 Yosemite is a place that everyone should visit at least once to experience nature and God’s creations at their best! If you are considering taking a vacation to Yosemite or If you have any questions and want to know more, please let me know!! 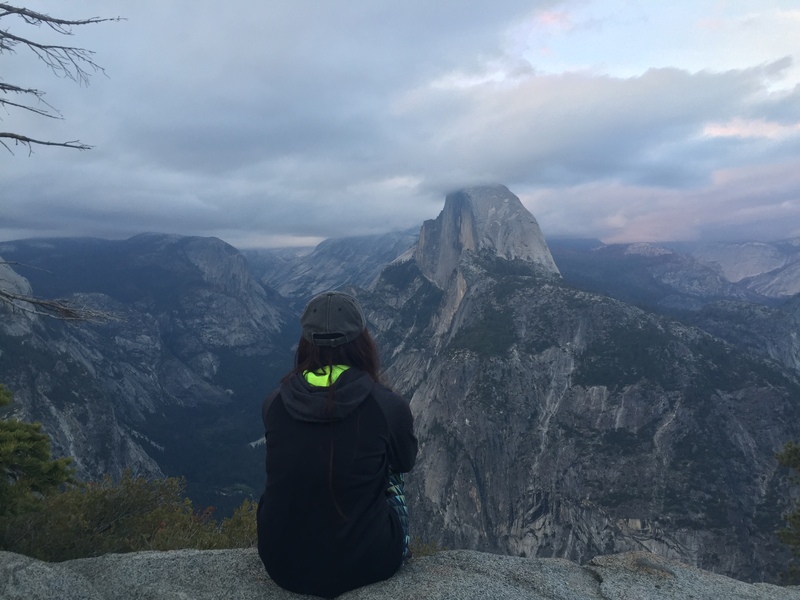 We even have a year pass to Yosemite and can help you save the $30 that you would otherwise have to pay to come in to the park for a week, so I’m more than willing to at least help you out that way! This trip can also be an easy fit into your budget by camping, packing food, planning ahead and making sure you have all the gear you need before hand, and after this trip, I can definitely give you some good pointers! Thanks for reading and please keep checking back for more of our little adventures! Ahh just catching up on your blog! Love this post – best weekend! Need to see you guys soon!